or, how Tom Cruise cured my fear of aliens. When I was 16, I found myself home alone on a rainy Friday night. I had just dropped out of high school and was spending the lazy Idaho summer waiting for classes at my local university to start. It had been months of slogging through the trenches of anxiety and depression, and the rainy Friday night was no exception. With my freshly minted driver’s license, I drove the family minivan through the rain to dig through the $5 DVD bin at the local Subway-smelling Walmart. Walking through the store, I remember wishing I were invisible. Every eye on me felt like an attack—for while I was certainly the subject of mere peripheral gaze, I felt obvious and intrusive. My body didn’t feel like my own, rebelling against me on a daily basis by producing unfounded exhaustion and the panging throbs of panic. I navigated the rows of the store as apologetically as I could, guilty for the space I took up, but nevertheless trudging on. Elbow deep in DVDs, I struck gold toward the bottom— Steven Spielberg’s War of the Worlds. Back at home, I popped some popcorn and stuck the DVD in my laptop. I felt some of my anxiety ease off… but as the opening credits rolled, I realized I had made a mistake. I grew up with a debilitating fear of aliens. I used to have nightmares where creature-infested meteors crushed my home and family, dreams where I ran away as aliens invaded and shot lasers down from the sky. I’d cover my head with my pillow every time I heard the X-Files theme on my parents’ television. Even when I was old enough to know better, I avoided looking at the night sky for fear I’d see a shooting star. And now, here I was, on a lonely, panicky night, watching a movie about my childhood phobia. The rain pummeled down and the thunder shook the house. I wanted to turn the movie off, but couldn’t. Fear had paralyzed me and the shame of such an irrational fear burned across my body. I felt like I had been pulled into the movie, certain that the lightning outside meant that fiction was bleeding across the barrier of reality, and that at any moment an alien machine would be terrorizing my street. I couldn’t even spare a laugh at the irony of the weather. I peeked through my fingers to glance at the screen— and suddenly felt calm wash over me. Tom Cruise filled up the frame, standing in that Tom Cruise sort of way: Legs apart, arms hovering away from his body, looking almost like a comic book character. There was a confidence and physicality to his movements that felt grounding. Even though it felt like the world was ending, by looking at Tom Cruise I knew I’d be okay. Tom Cruise would save me. I laughed out loud at the thought, the panic attack easing its grip. Tom Cruise will save me. As I finished the movie, I watched Cruise’s decisive movements and electric energy. He doesn’t exactly save the day—that’s a feat won by the common cold— but he saves his daughter. That was enough. The logic held, and I made it through the night. Later that summer, I went to see Knight and Day in theaters. In the film, Cruise plays a caricatured version of his usual action-hero role. Something about seeing him on screen, again, was contagious— a confidence that was foreign to me but integral to Cruise’s persona. The next day I went to the bank, and, with the movie still coursing through my veins, I flirted with the cute teller. It was a small act, but for me it felt brazen, and as the teller and I smiled across the counter I felt a surge of courage. Somehow, that contagious confidence caused a momentary lapse in my anxiety. The first time I parallel parked was after seeing Mission: Impossible – Ghost Protocol. The first time I considered going to film school was after watching Minority Report. The first time I went to see a movie by myself was to see Oblivion. The first time I turned off a movie because I hated it was when I rented Mission: Impossible II. Each time, seeing Cruise in movies continued to have this strange effect, as if I was invincible because he was. The idea that Tom Cruise would jump down from the nearest building and stunt me to safety was no less insane than the intrusive thoughts and strange physical symptoms that similarly seemed to fabricate out of nowhere— so I rode that feeling of security. For each “first,” I powered through the demons of my own brain and borrowed from the confidence Cruise projected from the screen. 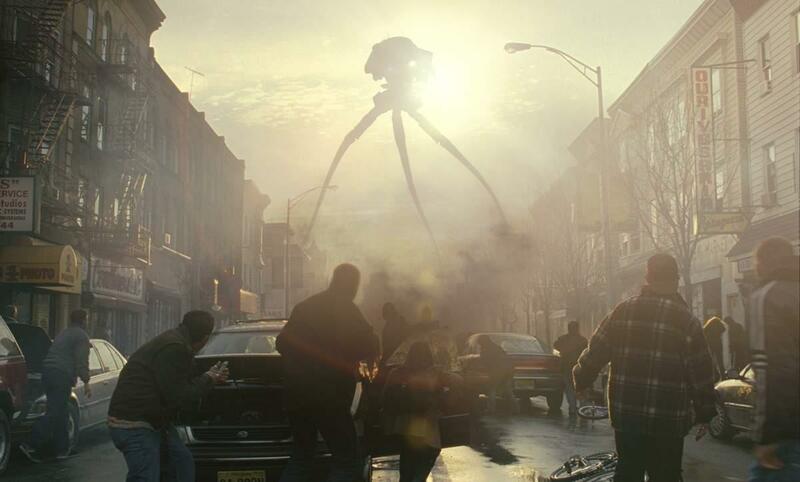 Years have passed since the night I first watched War of the Worlds. Since then I’ve gone to college and therapy, I’ve traveled and worked, and I’ve built my own confidence instead of outsourcing it. However, growing up has also meant reevaluating the events of the past, and I’ve found myself turning back to Tom Cruise, wondering where his place is in my personal pantheon of movie heroes. This has been especially true as in the years between there has been an influx of women on screen, many exhibiting the confidence I found so appealing in Tom Cruise. There have been the female-driven utopias of the Amazons’ Island and Wakanda. There have been Charlize Theron’s action heroes in Mad Max: Fury Road and Atomic Blonde, the soldier-scientists of Annihilation, and the physical action-comedy of Melissa McCarthy in Spy and Ghostbusters. Each time watching these powerful, confident woman on screen awoke something deep within me, healing wounds I didn’t know were there. Most recently, I burst into unexpected tears watching Rey as she removed the rocks from the cave’s exit in The Last Jedi, a moment which suddenly validated my childhood days of pretending I was a Jedi. I’m still a Tom Cruise fan, but it’s troubling that the traits I needed to see as a teenager were unavailable to me through representations of women or otherwise more diverse role models. With so many examples of incredible women for me to now draw on, where does Tom Cruise fit in? I’m a woman who is quiet and nervous and bookish and far from athletic, and I’ve spent most of my life governed by an innate sense of self-consciousness— traits that, while not inherently negative, are very present in my life. Needless to say, Tom Cruise—at least, the one on display— is not like me. Tom Cruise is the definition of celebrity. He’s handsome, charismatic, mysterious, highly problematic, and possesses a generous dose of tabloid-filling insanity. There are stories about him I wish weren’t true, and many I’m happy are. I’m young enough that I only really know Tom Cruise in this latter act of his career. The teenage-heart-throb Tom Cruise was before my time, and I was too young to contemporarily watch the 1990s films that featured Cruise’s more serious acting or pay attention to the couch-jumping tabloid frenzy of the early 2000s. The Tom Cruise that I know is an action star, and so is anchored to a certain type of character who possessed specific traits— traits that are tied-up in his real life personality. Identifying the traits I found so appealing in Cruise has helped me understand why I felt the need to borrow confidence from a straight, white man. What about his onscreen presence felt so simultaneously appealing and unattainable to me? The most obvious trait is Cruise’s physicality. He’s known best as an action hero—a genuine athlete who very notoriously performs his own stunts. Cruise has free climbed cliffs and skyscrapers, held his breath like a Navy SEAL, and hung off the exterior of a flying plane. But Cruise’s physicality goes beyond the stunts—and what I find most compelling about Cruise’s bodily power is his way of inhabiting space. This might be what I initially noticed in War of the Worlds on that stormy summer night. Cruise’s character Ray Ferrier is introduced as he’s leaving work. Ray walks in wide, solid steps. His arms swing to the side and as he speaks he gestures broadly and decisively. His emotions manifest themselves in physically intense ways— in one scene, Ray has an argument with his son which concludes with him throwing a baseball through a window. Even after the alien invasion, when Ray is stripped of resources, his body remains powerful. Ray uses himself to shield his daughter and carries her to safety. 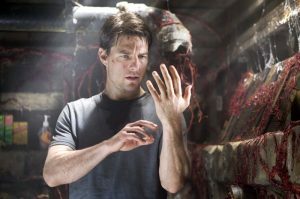 When he’s trapped in a basement in the second half of the film, multiple close-up shots show Cruise’s hands exploring the world around him. Rather than looking, he feels— touching the vein-like spread of alien life, exploring the world physically rather than mentally. Aliens may be invading earth, but Ray continues to move through the world as if it belongs to him. The attributes of Cruise’s performances—the intense gestures and wide stance—are stereotypically male, as if he’s manspreading on the frame. In large part, this presence is why he’s viewed as a macho idol. But it’s also evidence of a deeper attitude—a belonging, that is often absent from female behavior onscreen and the stereotype of female behavior overall. Cruise’s physicality asserts his presence on screen. He takes up space but never apologizes for it. He claims it. To see a woman inhabit space in this way is relatively rare on screen. In War of the Worlds, Miranda Otto plays Cruise’s wife. Her presence is, by comparison, demurely apologetic. She pulls her arms tight around her, and her head is often downcast. While her character has reason to assert herself in the face of Cruise’s jerkish Ray, she is submissive. In both War of the Worlds and Minority Report, the main female characters are literally carried through the film, clinging to Cruise’s solid frame. They are not given a chance to stand on their own two feet. My own relationship to my body has always been complicated. In addition to being tall and plus-sized, the physical symptoms of anxiety and depression have always made me feel like my body didn’t quite fit— achiness, itching, sweating, shaking— you name it— have all made me feel uncomfortable in my own skin. Consequently, the stance I adopted was one of apology. To move through the world as Cruise did was a foreign concept— to demand the space I deserved was not on my mind. In contrast, the poses natural to Cruise are ones that physiologically boost your confidence. Perhaps by watching Tom Cruise films I caught some of that physicality, an unconscious imitation that temporarily rewarded me with dopamine. Demanding and claiming space in the world for myself made me realize, if only briefly, that I belong. The second trait of Cruise’s that inspired confidence in me is his concentration. There’s no way Cruise can be governed by self-consciousness— he’s got things to do! Many of Cruise’s characters throw everything toward their goal, even when—especially when?—it puts them in danger. 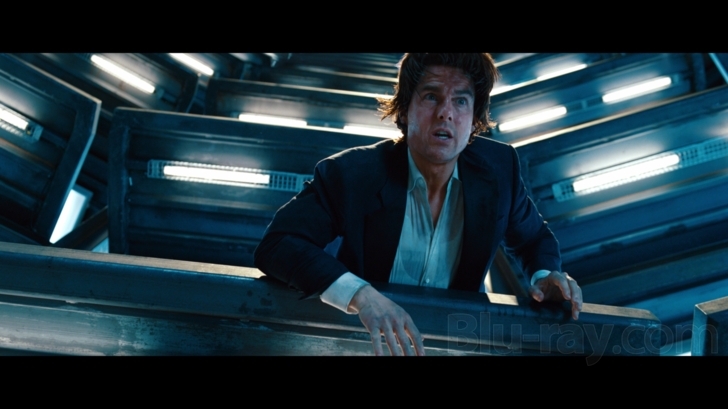 Cruise touches things he shouldn’t touch in The Mummy, climbs the Burj Khalifa in Mission: Impossible – Ghost Protocol, and literally throws himself repeatedly into death in Edge of Tomorrow. 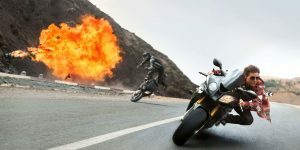 In one sequence of Mission: Impossible – Rogue Nation, Ethan Hunt has drowned, barely brought back to life by an AED— when his romantic enemy Ilsa goes running off with the MacGuffin. Hunt’s single-minded focus does not deter him for a second. Even though he was quite literally dead just moments before, Hunt springs into action, only one thought driving him: “We have to get to her.” In the next few minutes Hunt stumbles, crashes, and tumbles through a car chase, blinking away the death as if it’s just a hangover. “A minute ago you were dead!” protests Simon Pegg’s Benji. “What are you talking about? !” responds Hunt. His focus is so intense that he only has room for that one thought. My ability to focus was always a hallmark of my personality— especially as a good student— but anxiety often robs me of that. The lack of focus and inability to concentrate that my anxiety and depression produce continue to be some of the most frustrating and disturbing symptoms for me, stealing away productivity, keeping me from making important decisions, and making things I enjoy— films, concerts, baking— difficult chores. The idea of flow comes to mind, a state which I constantly crave— and see plentifully in Cruise’s films. 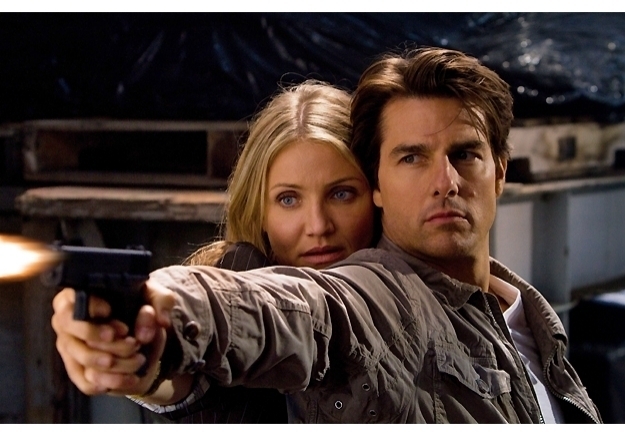 Cruise’s focus also comes through in another area of his acting: his dialogue delivery. Cruise has a quick, driving delivery. The film Collateral opens with a long conversation between Jamie Foxx and Jada Pinkett Smith as Foxx (a taxi driver) drives through the city. Their conversation is filled with pauses, hesitations, and pointed looks as they consider each other and their words. They make a bet about Foxx’s navigation; “I don’t think I’ll be wrong, but if I am, your ride’s free” says Foxx. There’s a long pause as Pinkett Smith smiles, glances toward the window, and studies Foxx. “Okay,” she answers, quietly, slowly. When Cruise’s character first meets Foxx their conversation is vastly different, although the situation is basically the same. Cruise relentlessly moves forward with quickly paced questions, eventually taking the conversation over altogether as he throws out statistics of Los Angeles and tells morbid stories about the lack of human caring. He’s constantly moving, working with the tech in his briefcase, adjusting— there’s no time spent gazing at the city or thoughtfully considering the driver. It’s all about that end goal, that focus. There’s no hesitation in his voice because the idea that his words are not valid isn’t even a consideration. I’ve always struggled with being forthright about my opinions in a conversation, often giving leeway to the more dominant voices in a conversation, and conceding when I can’t pull my thoughts together or stumble over my words, even if I know deep down I’m right— a behavior reflected by the women on screen. Watching Cruise, and borrowing from his focus and certainty, made me feel like I could stand my ground with my opinions. The last trait I find aspirational in Cruise is his perseverance. While Cruise’s characters usually win out in the end, he’s by no means an untouchable hero. He gets beat up along the way, often taken to the edge of failure only to pull success in the end. There’s an archetypal nature to that trajectory—succeeding against all odds— but there’s a special charm to the way Cruise triumphs. There’s something special about being a hot mess and succeeding in style anyway. This is very physically apparent in Mission: Impossible – Ghost Protocol. After an around-the world chase to stop the launch of a nuclear warhead, Ethan Hunt and his team discover that they’re too late— the missile’s been launched. It looks like the end, but Hunt remembers there’s a way to stop the missile manually via a computer in a briefcase. What follows is an insane chase through an elaborate parking garage in Mumbai. Hunt runs up flights of stairs, gets beat up, jumps off a landing to land several floors down, crashes through a car windshield— until finally, with a broken ankle, no guarantee of success, and the missile just moments away from crashing into San Francisco, he literally drives a car off of one of the top levels of the garage and— mostly dead at this point— hits that button just in time. This sort of tension is, of course, a trope integral to the franchise— but the way Cruise is beaten to a pulp beforehand, showing his mortality in a way a superhero film wouldn’t— makes his perseverance all the more notable. The perseverance of Cruise is notable because he is allowed to fail first. The stereotype of the “Strong Female Character” often comes off as one-sided because the idea of female strength is incorrectly translated as an absence of vulnerability or weakness. We can see Cruise beaten to a pulp, ugly and bruised, humbled and insignificant, and this doesn’t take away from the fact that he’s still the hero. While ugliness is par for the course when it comes to the journeys of Cruise’s characters, ugliness in female heroes is somehow still unexpected (just think of the constant conversation around Charlize Theron’s willingness to be “ugly” for roles). Failure does not mean that Cruise is weak. Instead, it’s an opportunity for him to grow stronger— and by watching him fall far and still get back up, I borrowed from his movies the idea that I can fail along the way. It’s no wonder that these traits of Cruise’s action hero presence made me feel, by proxy, like a more confident person. Physicality, focus, and perseverance are part of a larger paradigm that is quintessentially American and has come to represent the ideals of success at large. Additionally, claiming my own space, obtaining focus, and persevering in spite of failure are all attributes I wish to further develop on a personal level. So why were these traits unattainable? Watching Cruise in these movies led me to manage my anxiety, but only momentarily. The borrowed confidence that I received from Tom Cruise’s movies was just that— borrowed. I shortly reaped the benefits of the confidence high I got from watching him, but that confidence inevitably dissipated. There was always a separation between him and me— a separation in the form of gender. While watching Tom Cruise in action flicks gave me that impossible feeling of invincibility, that feeling always faded, because while I was watching him I was also absorbing the other messages these films presented about women. And so the confidence remained in the movies rather than with me. Perhaps that’s why seeing women action stars has been so meaningful to me— that confidence doesn’t need to be borrowed anymore. Watching people who look like me feels more like an invitation to join in the fun rather than a representation of the unattainable. There’s no reason to have confidence by proxy when I could just have confidence inherently. Mission: Impossible – Fallout comes to theaters soon, and I’ve found myself trying to reconcile the version of myself that exists now with the version of myself that found comfort in War of the Worlds years ago. Part of me wonders if I would have been different today if I had seen more women on screen while growing up. I think it’s likely that I would be. But the other part of me is grateful, because even through the dearth of women on screen, these films fulfilled a specific need to see reckless confidence on display. And perhaps in the steps of Emily Blunt in Edge of Tomorrow or Rebecca Ferguson in Mission: Impossible, these films will contribute to the conversation moving forward. And I’m still a Tom Cruise fan. There are reservations and caveats, yes, but I am. I love Tom Cruise’s crazy commitment to his roles. I love that he never clocks it in. I love that he performs his own stunts with Buster-Keaton-like tenacity. 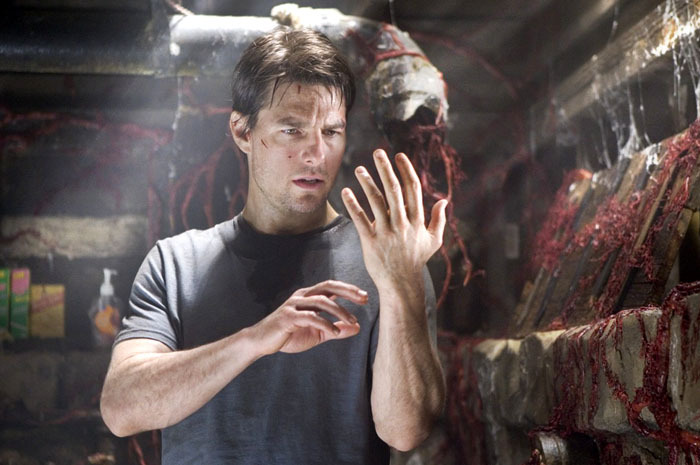 I love that Tom Cruise has made films as good as Magnolia and Minority Report and as bad as The Mummy and Jack Reacher: Never Say Never (kidding, it’s Jack Reacher: Never Go Back). I love his stunts, his bizarre optimism, and his obsession with film. I love watching Tom Cruise movies. I love that Tom Cruise doing huge impossible things makes me feel like I can do small impossible things. I love that Tom Cruise, in an absurd way, has helped me manage my mental illness. So I’ll go to Mission: Impossible – Fallout opening night, and I’ll drag my friends with me. At the end of the day, at least I’m not afraid of aliens anymore.